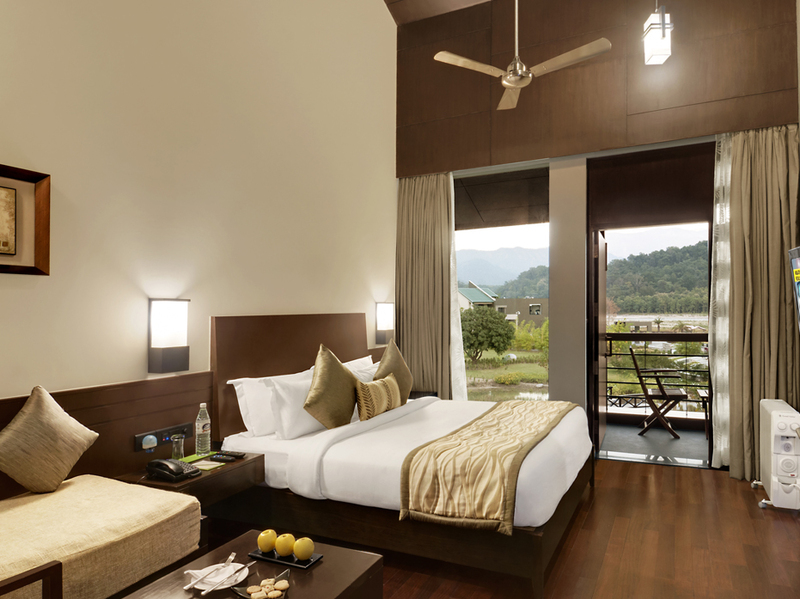 Snuggled in the lap of nature and wildlife, and sprawling across 8.75 acres of lush greenery, Namah is a beautiful upscale resort, situated near the Jim Corbett National Park, overlooking the serene Kosi river. With nearly 50 rooms, including superior rooms and suites, this luxury resort is sure to leave an indelible mark on your mind, making you want to come back again and again. All rooms feature desks, phones, high-speed wireless internet connectivity, a mini bar, safety lockers, a 32-inch LCD screen as well as a tea and coffee maker. The well-appointed en-suite bathroom with an attached shower comes with complimentary toiletries, ensuring a rejuvenating and refreshing experience. Enjoy the relaxing ambience, sitting in your very own private balcony while you sip on your favourite drink. Spanning on an area of 420 sq. 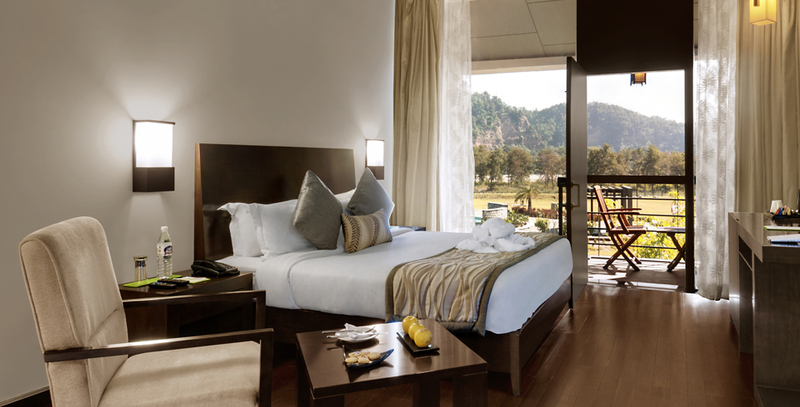 ft., our premier rooms on the ground floor open out to large garden spaces, while our premier rooms on the first floor offer a panoramic view of the majestic Sitabani mountains, the serene Kosi river and the lush, blooming gardens. Aesthetically decorated, our Superior rooms encompass a blend of modern amenities and old-world grandeur. Perfect for a group stay with friends and family, or an intimate honeymoon, these rooms cover an area of 460 sq. ft. What’s more? These rooms open out to a private balcony with mesmerising vistas that are not only soothing for the mind, but also for your soul. 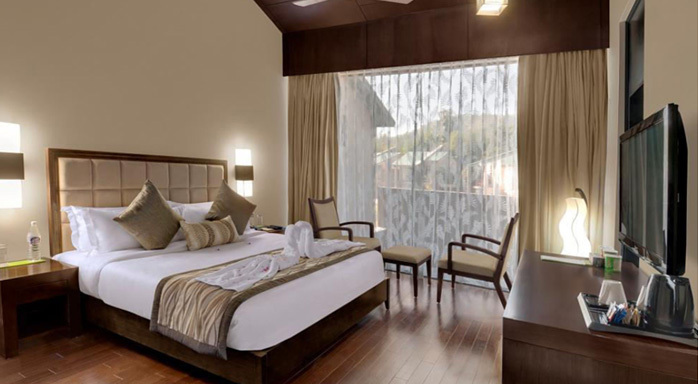 The luxurious and spacious suites at Namah are designed for a soothing and relaxing experience. The living room has an attached bathroom and expansive balcony. Step out onto your private balcony for a breath of fresh air and sunlight while you take in the beautiful views of the surrounding mountains and rivers. The bedroom is furnished with a king size bed, built-in wardrobes and an attached bathroom.